A new poll conducted by top Democratic pollster Celinda Lake for the Larry LaRocco for Senate campaign shows that 54 percent of Idahoans surveyed disapprove of George W. Bush's job performance - this from a state where Bush scored some of his highest margins in 2004 and 2000. This may bode ill for LaRocco's Republican opponent Jim Risch, who has tied himself to Bush despite the president's flagging fortunes. There's more at New West, and the LaRocco campaign says it has some more interesting numbers that it'll release Tuesday. Meanwhile, as "scootermom" notes in the comments at New West, you really have to wonder about the 46 percent of our neighbors who do approve of Bush. And of course, Bush isn't running this year; McCain is. Here's hoping the Lake-LaRocco poll asked about the presidential race as well. Update: Per New West's report, "Lake’s poll also showed 54 percent had a favorable opinion of McCain while 50 percent viewed Obama favorably." That's not the same as "If the election was held today, would you vote for McCain or Obama," but it does show an unusually competitive landscape for Obama here in the Gem State. Our candidates need our help before midnight tonight! It's the end of June, and you know what that means: the finish of another financial reporting period for folks running in federal races. So before you head off to do whatever fun stuff you're doing this weekend, or before you get back into the swing of your work week on Monday the clock strikes midnight tonight, please use "the tubes" (thank you, soon-to-be-retired Sen. Ted Stevens!) to make online donations to Barack Obama, Debbie Holmes, Larry LaRocco, and/or Walt Minnick. They don't have to be big; it's far more important for our candidates to be able to show wide support from many small donors - including those of us who spend lots o' time here on "the Internets" - than a bunch of fat cats. On behalf of a stronger, more representative democracy that works better for all of us ... thanks! P.S. Don't forget the Unite for Change parties - nearly 20 of 'em, all across Idaho - on Saturday, June 28. This post will ride on top of the blog through midnight Monday. You can use it as an open thread for weekend events or whatever else is on your mind, spam excepted. Larry LaRocco is still waiting to hear from Jim Risch. Last Saturday on NBC News Channel 6—KPVI-Pocatello during a live, 30-minute television interview, LaRocco called Risch out, challenging him to be in the traditional Idaho Public Television debate for their Senate race his fall. LaRocco also called on Risch—again—to apologize for a lying ad he put on TV during the primary, and still has on his website. Risch claimed to have made the largest tax cut in history, but didn’t mention the 20 percent sales tax hike he passed to pay for it. Risch ignores scathing rebukes from Idaho’s major newspapers. Remember the Idaho Statesman front-page headline, “Hold on a Sec, Mr. Risch.”? Or the Lewiston Tribune calling Risch, “the shiftiest of politicians.”? Or the Post Register writing, “The kind of fuzzy math Risch just outlined led to unfair federal tax breaks for the rich and massive budget deficits for the rest of us.”? In other news this week, Larry LaRocco joined 12 workers in the manufacturing division of Everton Mattress Factory in Filer. The Everton Mattress retail store is in Twin Falls. This was LaRocco’s 26th job in his “Working for the Senate” campaign. KMVT has video here. 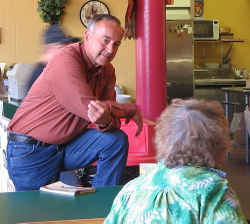 Stay tuned for campaign news at www.laroccoforsenate.com. Folks, this is The Blogmother telling you I'm a big fan of The Ed Schultz Show. Ever since Big Eddie made his Treasure Valley radio debut on KFXD 630 AM about a year ago, I've listened in almost every weekday. Schultz, who is based out of Fargo, North Dakota, is a Republican-turned-Democrat with a working-class heart and listener base. In other words, he's a perfect fit for Idaho. An example: Yesterday, while talking about BushCo, er, the Supreme Court's decision to slice the Exxon settlement, Schultz took a call from a small commercial fisherman in Alaska who called in from his boat. Schultz grilled him on how the corporate-friendly settlement screws over Northwestern fisherfolk, but you could tell his real glee was talking with the dude about what rigs he was using to catch salmon. The hour before that, two evangelical Christians called in to say that no matter what James Dobson thinks, they'll be voting for Barack Obama this year, and that many other evangelicals will be doing the same. Schultz agreed, noting how Obama is obviously a strong family man as well as someone (like Schultz) who will not necessarily toe the Democratic party line on every single issue. On issues ranging from veterans (whom he supports with a passion) to gas prices (Schultz frequently gets calls from long-haul drivers whose diesel bills are killing them), Schultz is the real deal. For sure, if the Idahoans who spend their days listening to Rush, O'Reilly, and Savage would give Ed Schultz a few days, they may find they have more in common with this hunting, fishing, and truck-driving guy with a dog named Buck than they do with the pill-popping, sexual-harrassing, hate-spewing GOP talkers, never mind Idaho's low-rent version. In fact, if we could get Big Eddie on the air in every part of the state, well, there's no telling how blue we might move. 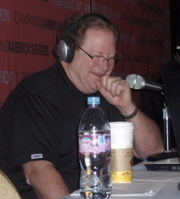 But The Ed Schultz Show is currently only available in two Idaho markets: Coeur d'Alene, via Spokane station KPTQ, where it airs live from noon to 3 Pacific Time, and Boise, where it airs on tape delay on KFXD from 4 to 7 p.m. You can also hear it live on the Big Eddie website from 10 a.m. to 1 p.m. Mountain, or via XM or Sirius satellite radio - but that's not the same as local radio, now, is it? So call your favorite stations in Salmon, Idaho Falls, Pocatello, Twin Falls, McCall, Lewiston, or Sandpoint and ask about The Ed Schultz Show. I'll also go on record here as saying there'd be no finer speaker for the next big Idaho Democratic dinner - even if he probably wouldn't fit into a dread plaid jacket. Note: Eddie's guest host, "senior legal analyst" NorMAN GoldMAN, seems to be on tap for today's show. He's good, too, though no real substitute for Big Ed. So if you haven't listened to the show before, be sure to tune in when Big Eddie is back. Come to the Debbie Holmes for Congress General Election Kickoff Party tonight at 5:30, at Davies Reid (515 Main) in Downtown Boise! There will be free food and beverages, although a donation to the campaign is recommended. I recognize the change we need concerning our government's stance on energy issues. We need a strong research program dedicated to improving the sustainability and safety of various alternative forms of energy. Right now, between our dependence on foreign oil and climate change, we are very vulnerable, both on a national and a global scale. I believe my answer to the previous question answers this question for the most part. Currently, with the price of oil per barrel wavering around $130, there's quite a lot of interest in making alternative forms of energy sustainable and safe. But for at least 30 years, we've known we had a problem. Every time the price of a barrel of oil goes down, we lose interest in renewable and sustainable energy programs. We do not have energy security or sustainability in the status quo, and we need to focus on changing this in the long term, regardless of short-term improvements in the carbon-based fuel market. An aftereffect of a strong research program such as the one I propose would be an increase in the number of jobs available in this country. With unemployment up and wages, this would be a great benefit, if an incidental one. Mike Simpson has discouraged government investment in renewable energy and has refused to cut a penny in big oil subsidies. I pledge that I will never be in the pocket of big oil and will always look at the bigger picture; we need a sustainable energy economy; sticking with the failing system of the past is not the route to a brighter future for America. Visit our website here or donate to the campaign at ActBlue. Go to SEFORA for related policy statements. Did you know the schools in Shoshone County can't buy a new bus for next year? And that they won't get a new roof this summer for one of their elementary schools? They don't have the money, because Congress has so far failed to act on its promise to help rural counties that are struggling with their federal lands. Idaho counties with large percentages of federal land -- and school districts within those counties -- can't tax that land. And if the biggest landowner in the county can get away without paying its fair share, everyone suffers. That's why the federal government gave those counties a share payments from timber harvests. When those harvests dropped off in the late 90s, the federal government stepped up with payments for their fair share of local taxes. The funding was critical, and keeps many of Idaho's rural counties afloat. But the current Congress has yet to pass legislation to extend the program for another year. A recent measure went down in defeat -- thanks in part to Bill Sali voting against it. His vote and his inability to work across party lines to solve this problem for rural Idaho could have devastating effects on rural Idaho. But we can do something about it. We can defeat Bill Sali, send Walt Minnick to Congress and have a representative who wants to get things done for everyone in Idaho. Central Boise (Women for Obama) - 4 p.m. Saturday. Get details and RSVP here. Central Boise - 7 p.m. Saturday in the Silver Maple Picnic Area at Municipal Park. RSVP here. South Boise - 7 p.m. Saturday. Get details and RSVP here. Coeur d'Alene - 1 p.m. Saturday. Get details and RSVP here. Garden City/Eagle - 1 p.m. Saturday. Get details and RSVP here. Hailey - 3 p.m. Saturday. Get details and RSVP here. Hailey (Women for Obama) - 4 p.m. Saturday. Get details and RSVP here. Hayden - 5 p.m. Saturday. Get details and RSVP here. Idaho Falls - 3 p.m. Saturday. Get details and RSVP here. Idaho Falls - 7 p.m. Saturday. Get details and RSVP here. Meridian - 5 p.m. Saturday. Get details and RSVP here. Moscow - Noon Saturday. Get details and RSVP here. Moscow - 3 p.m. Saturday. Get details and RSVP here. Nampa - 6 p.m. Saturday. Get details and RSVP here. Pocatello - 4 p.m. Saturday. Get details and RSVP here. Salmon - Noon Saturday. Get details and RSVP here. Sandpoint - 4:30 p.m. Saturday. Get details and RSVP here. Twin Falls - 5:30 p.m. Saturday. Get details and RSVP here. Most of these parties are at private homes, so they may be maxed out by the time you try to sign up. (Some were close to capacity at post time.) Don't worry - there will be many other Obama organizing events over the coming weeks and months. Try another nearby town, or search for other future events here.